George Zimmerman Auctioning Off Gun He Used To Kill Trayvon Martin : The Two-Way "Now is your opportunity to own a piece of American History," said the GunBroker.com listing by "GZ1776." The website then pulled the listing, saying it wanted "no part in the listing." 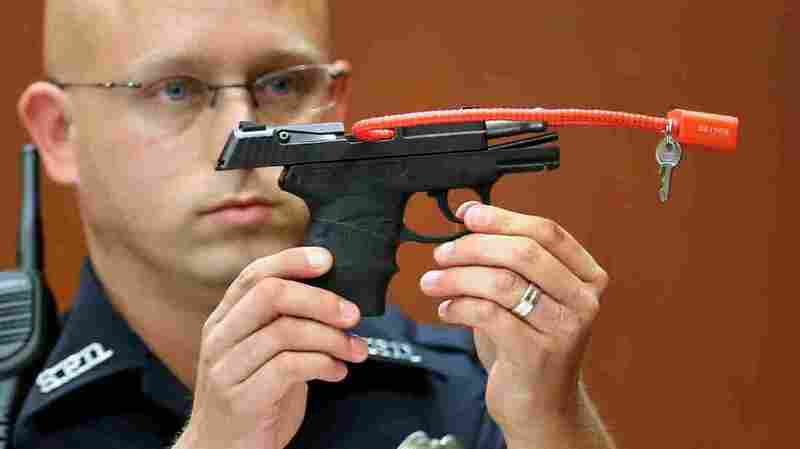 Sanford, Fla., police Officer Timothy Smith holds up the gun that was used to kill Trayvon Martin, while testifying on June 28, 2013, the 15th day of George Zimmerman's murder trial. Zimmerman has listed the gun for sale online. The 9 mm pistol was initially listed for sale on GunBroker.com, posted by user "GZ1776." By Thursday afternoon, however, the listing for the auction, which was supposed to begin at 11 a.m., was no longer active. In a statement on GunBroker.com, the company wrote that it reserves "the right to reject listings at our sole discretion, and have done so with the Zimmerman listing. We want no part in the listing on our web site or in any of the publicity it is receiving." "Late last night, George Zimmerman created a listing on our web site for the gun from the Trayvon Martin case four years ago. Mr. Zimmerman alerted news organizations that began reporting on the listing first thing this morning. "Listings on the GunBroker.com web site are user-generated, exactly like social media posts. Mr. Zimmerman never contacted anyone at GunBroker.com prior to or after the listing was created and no one at GunBroker.com has any relationship with Zimmerman." 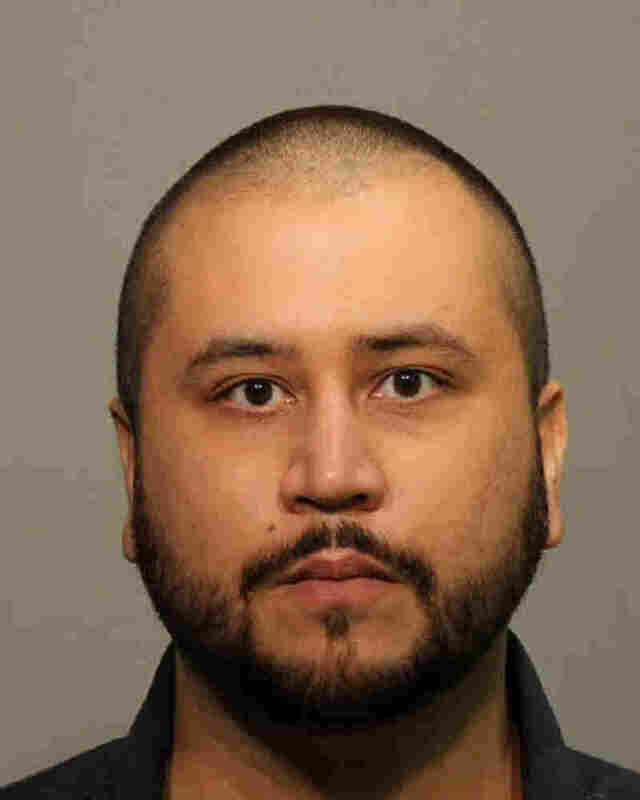 NPR's Greg Allen reports that the website pulled Zimmerman's Kel-Tec pistol before the auction began. Greg adds that Zimmerman told the Orlando Sentinel that the website was not "prepared for the traffic and publicity surrounding the auction of my firearm." He then listed the gun for sale with another website, UnitedGunGroup.com, which the website confirmed on Twitter. That link is also not functioning. "The firearm for sale is the firearm that was used to defend my life and end the brutal attack from Trayvon Martin on 2/26/2012," the original listing on GunBroker.com stated. It went on to say the gun is fully functional and had been returned to Zimmerman by the Department of Justice. "I am proud to announce that a portion of the proceeds will be used to: fight [Black Lives Matter] violence against Law Enforcement officers, ensure the demise of Angela [Corey's] persecution career and Hillary Clinton's anti-firearm rhetoric. Now is your opportunity to own a piece of American History. Good Luck. Your friend, George M. Zimmerman ~Si Vis Pacem Para Bellum~ "
Angela Corey was the attorney leading the case against Zimmerman, who was charged with murder and manslaughter but acquitted after he claimed self-defense. Si vis pacem para bellum is Latin for "If you want peace, prepare for war." Zimmerman spoke with Fox 35 Orlando, a local news station, and confirmed that he is auctioning off the gun he says was used to shoot and kill Martin. He told the news station that he has received death threats, both before and after posting the listing. "What I've decided to do is not cower," he told Fox 35 Orlando. "I'm a free American. I can do what I want with my possessions." The station also spoke with an attorney for Martin's family, who said the Trayvon Martin Foundation is "laser focused" on ending gun violence and "has no comments on the actions of that person." The auction was set to begin Thursday at 11 a.m., with a starting price of $5,000. The site on which the gun was listed first, GunBroker.com, has made headlines in relation to the Martin case before. In 2012, shooting targets showing a hooded figure holding Skittles and iced tea — the items Martin was carrying the night he died — were reportedly advertised on the website. GunBroker.com told Reuters the ads were removed as soon as the company was aware of them.